I'm starting a new message because the topic is different from my original message of purchasing a microscope. Lots of good info with that -- Thanks! I'm wanting to take photos of small insects, 1-3mm or so. I have explored the microscope option and the suggestions have been to go the route of adding a 'scope objective to my camera. I like that idea. I began the research and find the more I learn the more questions I have. I have a Canon T5i camera and I have extension tubes. I would be willing to get a StackShot. 1) I understand that a Plan objective is the best objective but is it the best for this application? 2) Would I need a finite or infinite objective? 3) How do I figure out what magnification of objective that I would need? 4) and once all that was done, where do I find the conical piece that would connect the objective to the extension tube. Again, many thanks for all the help! 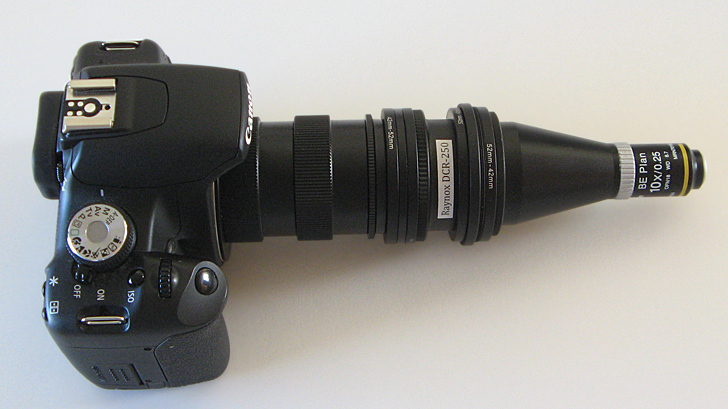 First, take time to read carefully our FAQ: How can I hook a microscope objective to my camera?. Many of your questions are addressed in there, and probably others that have not occurred to you yet. Be sure to notice that the FAQ now extends across 5 browser pages. The discussion gets a bit redundant, but it's probably a good idea to read them all. Plan Apochromat is the best, Plan Achromat is next to the bottom. Both are widely used for this application. The "gold standard" for long working distance and high image quality with minimal false colors are the Mitutoyo M Plan Apo series. Those are also pretty expensive. At the other end, the Nikon CFI BE 10X NA 0.25 and 4X NA 0.10 are much less expensive, trading off for shorter working distance and some false color. Nonetheless even the Nikon CFI BE's can do good work; see for example HERE . Both types are commonly used. If I were starting again from nothing with a modest budget, I would go infinite, probably using the Raynox DCR-150 and DCR-250 as "tube lenses". Divide the size of your sensor by the size of your subject and round appropriately. Your Canon T5i has a sensor width of 22.3 mm, so you're probably looking at a 10X objective. Those can also be pushed to lower magnification by using a "tube lens" shorter than 200 mm. In the example I linked earlier, I pushed the Nikon CFI BE clear down to 5X (4.4 mm across a 22 mm sensor) by using it on a 100 mm tube lens. Using the Raynox DCR-250 as a tube lens will push the Nikon and Mitutoyo 10X objectives down to 6.25X, giving you 3.5 mm across your sensor. It would be a good idea to pick up a 4-5X objective also. In the lower price range, the Nikon CFI BE 4X NA 0.10 is known good; in the upper price range, it would be the Mitutoyo M Plan Apo 5X NA 0.14. All of the required adapters can be purchased on eBay. Thanks. I've read and reread the link you provided at least 15 times over several days, googling terms and processes, but was not able to get my answers. I do appreciate your short answers. Maybe those will help me make more sense of the info as I reread it again. OK, thanks for the feedback. It's probably time to revisit that topic. The main posting is over three years old, and I'm sure we've learned a lot in the meantime. I see, for example, that nowhere in that FAQ is "Raynox" mentioned. Since I've just told you in previous posting here that those would probably be my first choice as tube lenses, that omission seems kind of serious! I have read and re-read and given this so much thought my head hurts. I'm starting to get it but still have some questions and would like to confirm what equipment I would need to start shooting. I'm including links to the parts that I found online so I'm sure we're talking about the same thing. This makes sense. One for the 5mm+ insects and one for the 1-4mm ones. I think I might have misunderstood what extension tubes were required. The site references M42 Extension tubes – what does M42 mean?? I have and Extension Tube set for my Canon – 3 tubes, 12mm, 20mm, and 36mm. Nowhere is the M42 referenced on the set I have. You recommended the Raynox lenses. Would these replace my 90mm macro, 18-55m wide angle, and 170-500 telephoto lenses? Would I use these interchangeably with the 4x and 10x objectives? Are there any other adapters or connectors that I need? Can I in any way use this set up with my Canon macro twin lite (MT-24EX) flash system? I think once I work thru this list, I'll be confident to start ordering. I am very appreciative of this forum and your time. The possibility of microphotography would not be available to me without this great resource! "M42" means 42 mm diameter x 1.0 mm pitch. See http://en.wikipedia.org/wiki/M42_lens_mount. It's just a basic mechanical screw thread that has become something of an interface standard in this field. Here are a couple of setups that I intend to add to the FAQ that you've been reading. I don't have a full set of tests shot yet. But I have enough to be confident that what is shown here are useful configurations. Note that I'm not presenting these as "for sure the best way to use these parts or accomplish this goal", just that it's a reasonable approach that gives me a good set of test shots for a modest outlay of cash. If you're willing to spend a couple of thousand dollars on lenses you can do significantly better. What's shown here is more like a couple of hundred. 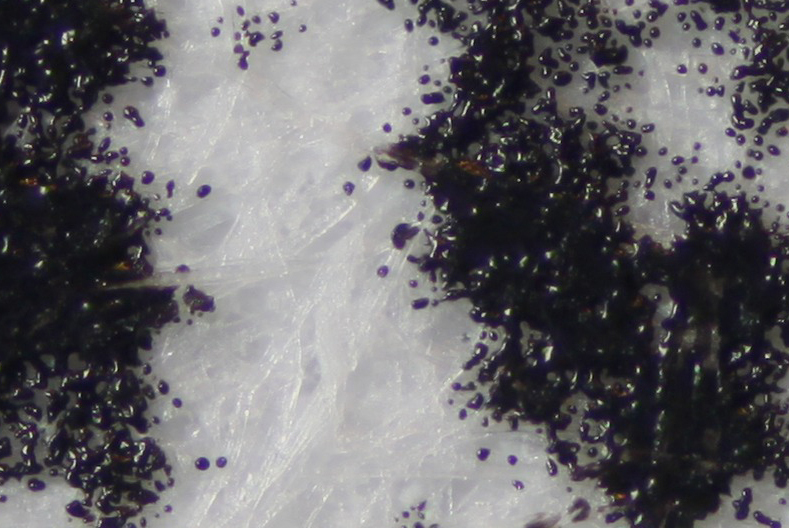 Here is using a Raynox DCR-250 in conjunction with a Nikon CFI BE 10X NA 0.25 microscope objective. In theory this gives magnification of 10*(125/200) = 6.25X, so about 3.5 mm across my sensor. Here is using a Raynox DCR-150 instead. 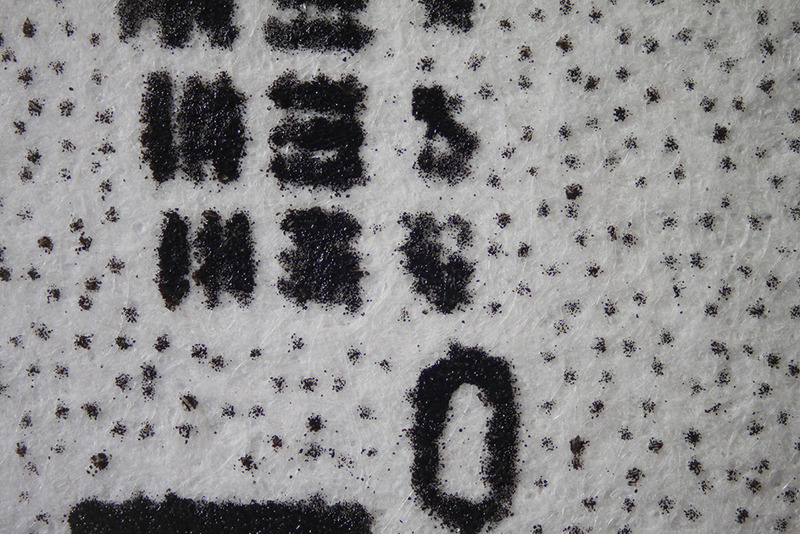 In theory this gives magnification of (208/200)*10 = 10.4X, so about 2.1 mm across my sensor. 2. Several sets of the cheapest available M42 extension tubes assembled so as to place the Raynox lenses near their infinity focus points. 3. M42 male to 52mm female adapter ring. 4. 52mm-52mm male-to-male reversing ring. 5. 49mm male to 52mm female step-up ring (installed in reverse to fit the Raynox lens). 6. Raynox lens, reversed so as to put its infinity-focus side facing the objective. 7. 52mm male to 43mm female step-down ring (installed in reverse to fit the Raynox lens). 9. 52mm male to M42 female adapter ring. Just to provide an example of the image quality you might expect to get from a rig like this, here are some closeups of a black-and-white test pattern that I've been using recently. It's a xerox-process paper copy of a grayed-out USAF resolution chart. 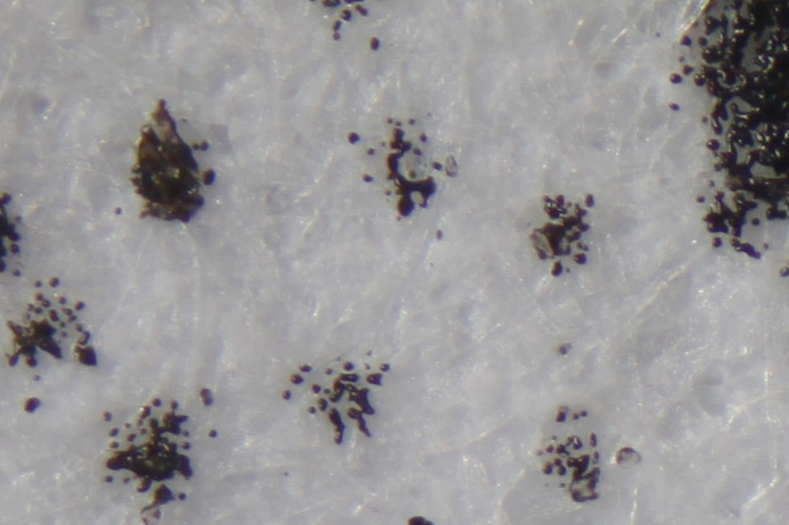 The toner particles from the copier make really nice shiny black dots against the white paper. Gives lots of sharp edges and opportunities to see color fringes if there are any. The above images are completely unprocessed; no sharpening and no CA removal. Sometimes it's difficult to keep perspective on what's implied by these actual-pixel crops that never look very sharp. To address that, let me say that if you made a 10"x15" print of this image, the corners would look good and the center of the print would fail to show all the detail that's in the digital image. Would these replace my 90mm macro, 18-55m wide angle, and 170-500 telephoto lenses? Yes, mostly. In the above setup, you might be able to swap in your 90mm macro in place of the Raynox DCR-250 and everything between it and the camera. That would give you lower magnification (multiplication factor of 90/200 instead of 125/200). I have no idea whether it would vignette or what the image quality would be. Your other two lenses would not be suitable for use with microscope objectives. Would I use these interchangeably with the 4x and 10x objectives? Yes. The setups with 4X objective would look just like the ones shown above with 10X. I’m still a bit confused about whether I need a chipped adapter or not. In the setups above, that's the adapter that goes on the camera to get me from Canon bayonet mount to M42 screw threads. Yes. The above images were shot with Canon 580 EX II flash, same principles. I spent about 6 more hours trying to comprehend all this yesterday and....I get it!!! Yippy skippy!! I'm a neophyte with the calculations. Which leads me to one other question...how did you figure the magnification part? Where did you get the 208 and the 200? You probably already know this, but I checked with the StackShot to see if the length of the 4X would be stable on their unit and here's the quote from them: "StackShot is a very rigid system and should have no issues with your setup. The two supports are made from 3/8" solid stainless steel rods." I'm sharing this as others may have the same concern. I think to use the twin lights I would need to finagle something though. At present, they clip onto the end of my macro lens. I would think they would be way to heavy for the 4X. I'll make that a separate question once I get my equipment. Thank you so much for all your help and the time you've spent with me. I appreciate your time, your sharing of your knowledge, and your patience with all my beginner questions! how did you figure the magnification part? Where did you get the 208 and the 200? When the rear lens ("tube lens") is focused at infinity, the overall magnification is just proportional to the focal length of that lens. Nikon and Mitutoyo objectives are designed to give their rated magnifications when used with a 200 mm rear lens. The DCR-150 is rated by Raynox as being 4.8 diopter, from which its focal length can be calculated as 1000/4.8 = 208 mm (approximately). So, using the DCR-150 at 208 mm instead of a standard tube lens at 200 mm, the magnification increases by a factor of 208/200. Thank you for mentioning this. I made the images shown here using a StackShot. Yes, the StackShot itself can carry this much load with no problem at all. With a long setup like this, I think it's better if both the lens and camera are supported and the weight is more or less centered on the StackShot. In my own rig, I bolt a long piece of wood to the StackShot carriage, then rest the camera and lens on that. Alternatively, you might place the camera and lens on a non-moving support, and use the StackShot as a subject mover. I think to use the twin lights I would need to finagle something though. At present, they clip onto the end of my macro lens. Good point. Yes, you'll need to do a different mounting. You're very welcome. I learn in these exchanges also, so it's a win-win situation. A viable alternative to the infinite objectives you listed is to use Nikon finite objectives; specifically CFN Plan Achromats, 4x and 10x. These work without a tube lens, just have them at 150mm from the camera sensors, a few mm more or less is OK.
You have some extension tubes so you just need a few more to give you 150mm. Setup: Camera + extension tubes + objective. The last extension tube (or ring) has to have a RMS thread to accept the objective. Yes, this is completely viable. I used to do all my work with finite objectives. 1. Very few good finite objectives are being manufactured at this time. That's because infinite objectives have technical advantages for the microscope manufacturers, so the major manufacturers mostly switched over to infinites a couple of decades ago. Nikon CFN Plan Achromats can still be found on eBay, but then it's necessary to know how to recognize those and avoid the many other objectives that are not so good. 2. The good used finite objectives have mostly been bid up in price to the point that they have little or no advantage over new infinites, especially if you already have a suitable tube lens or can amortize the cost of a tube lens over two or more objectives. If you do want to go with finites, I can recommend two new objectives: 1) the Nikon Achromatic Finite Conjugate 10X NA 0.25 sold by Edmund Optics HERE, and 2) the "Cnscope" 4X NA 0.10 objective described HERE. 3. Finite objectives tend to have smaller diameter fields of high quality image, compared to newer infinite objectives. This makes the finites much less flexible for use at lower than rated magnification. For example the Nikon CFI BE 10X NA 0.25 can be pushed down to 5X and still cover an APS-C sensor with high quality, where the Nikon CFN Plan Achromat 10X NA 0.30 barely covers even at 10X. See HERE, second image, for an illustration of what happened to the corners when I tried to run my CFN 10X at 6.9X. The Nikon Achromatic Finite Conjugate 10X NA 0.25 sold by Edmund Optics is better than usual in this regard, as shown at the same place. It is easy to mount the flash heads of the MT-24 for macro work without mounting them onto a lens. If you take the heads off of the lens bracket, you will see that there is a socket for a tripod head screw in the bottom of each, in the middle of the flash shoe. I use stands which are designed for mounting test dials for engineering. I purchased mine about two years ago on ebay UK. The cost, for both, including delivery was just over £20. I looked a few minutes ago on ebay UK and can only find the model which I have being sold along with test indicators, at about £20 each. I have the same model as is shown in http://www.ebay.co.uk/itm/METRIC-DTI-DIAL-INDICATOR-TEST-GAUGE-STAND-WITH-MAGNETIC-BASE-PRECISION-CLOCK-/271414555893?pt=UK_Measuring_Tools_Levels&hash=item3f319174f5 . When I bought them, I was not sure how I was going to mount the flash heads. When they arrived, I discovered that they had a screw which would fit that hole on the bottom of the flash heads. If you look at the picture of the stand in the linked item, you will see an arm at about the 2 o'clock position. There is a small nut on the end of this which unscrews to reveal the screw thread. It is the same as a 1/8 inch tripod screw! These stands have a magnetic holder in the base. This can be switched on and off as you see in the picture on the ebay listing. If you mount everything on top of a steel plate, you can place the stand wherever you want, turn on the magnet, and it will stay there. The arms of the stand can then be used to place the flash heads exactly where you want to. I purchased a piece of steel plate about 600 by 300 mm from the local B and Q hardware store. It is about 1 mm thick. This comes sealed in a hard clear plastic pouch (like a laminating pouch, but harder wearing). This is to stop the product from rusting before you get it home. I have left it sealed in its pouch. I paid between £6 and £7 for mine. Total spend was under £30, and I got a very flexible mounting solution. I can place the plate under my microscopes and use the flash there, or I can use it on top of the board which I mount my Stackshot on when I use it horizontally. I use an old toolmakers' microscope as a stand for the Stackshot when I use it vertically, so it has lots of cast iron to hold the stands. Peter -- Thanks for that info!! I've been thinking about how to design a system. Any chance you'd be able to take a pic of your set up, please? Yes, I will post some pictures - but not for a few days. I am not at home at the moment. I have everything on order! Thanks for all the help. I have a feeling I will be back with the equipment arrives -- either I'll be "bragging" or "begging"(for more help)!!! May I trouble you please to give me an indication of the length of M42 tubes back to the camera that I might need with an assembly for the DCR 250 and DCR150? On the DCR150 is there another tube or tubes behind the cone?